This walk: 2012-6-6. Grenofen Bridge car park, Gem Bridge, picnic spot, time capsule, notice board, gabion walling, River Walkham, Screw Bridge, Magpie Viaduct, mine shaft, cow wheat, stonecrop, brick works - red soil, grey wagtail, meadow buttercup. Link to Google Satellite view of the area - Gem Viaduct and Gem Cottage (the old Counting House for Gem Tin Mine) are just above the label "Grenofen Wood" - actually the new bridge isn't shown, what is in place is the old wooden footbridge (now gone). Magpie Viaduct is towards the bottom-right corner of the image. The old tin mine used to be just below the new bridge and slightly to the west. A walk over the same area was undertaken on 24th May 2012. The path near the start of the walk. Believed to be a rabbit hole, too small for badgers, but no "sign" of any animals. Notice board showing some key stages in the construction. To see a larger view, click the photo. Service road leading to the A386 - the gates are kept locked, as are the gates at the top of this road. There is no parking here. Another view, Gem Bridge off to left of the notice board, car park off to top right. Another view showing the new bridge, officially opened on 22nd May 2012, costing £2.1M, i.e. opened in time for Queen Elizabeth II's Diamond Jubilee and to coicide with the Summer of Cycling. The previous bridge (rebuilt 1910 using iron girders) was demolished in 1960's. The new bridge was partly funded by a £600,00 EU grant with the aim to improve cycling links between UK and France. This cycle track runs from Ilfracombe, on the north Devon coast, to Redon, in south Brittany. Brunel's bridge was 40 metres high and over 300 metres long. The new bridge is 24 metres high and 200 metres long. Gabion walling, a form of construction that is designed to counter erosion. Some of us just have to put our head between the bars! Down below the bridge is a small gate on the north bank of the river, just west of the bridge, that leads to the old tin mine area. Looking straight down onto the river. Approaching Screw Bridge, possibly a corruption of Skew Bridge, where the bridge does not go straight across the obstacle but at an angle? The bridge is also unusually sloped across the old railway track, which is the South Devon & Tavistock Railway (1859) with five viaducts and three tunnels: the line closed in 1962. The whole path/track area has not been finished with gravel paving onto tarmac. A view of the trees below the viaduct. Looking across to one of Brunel's original brick piers for his original wooden bridge. Some information about the railway: this was the Plymouth to Tavistock line, completed in 1859 by Brunel for the South Devon & Tavistock Railway Company. It was heavily engineered with Cann Viaduct, Riverford Viaduct, Bickleigh Viaduct, Ham Green Viaduct, Magpie Viaduct and Walkham Viaduct (now Gem Bridge). It also had Mutley Tunnel, Shaugh Tunnel, Yelverton Tunnel and Grenofen Tunnel. It was built in broad gauge (being designed by Brunel). Later, the London and South West Railway reached Lydford in 1874. In 1876 a third rail was added to the Plymouth-Tavistock line and it was run as a dual gauge railway until 1890 when a separate standard gauge line was built from Lydford to Plymouth. The Walkham Viaduct (Gem bridge) was rebuilt in 1910 using iron girders, prior to that it would have been wood on brick piles. Going down the footpath alongside the railway line/cycle path to reach under Magpie Viaduct. Old mine shaft at the bottom of the track. Believed White Stonecrop, Sedum album, alternatively, the reader is invited to decide from the following types: Australian Swamp Stonecrop, Biting Stonecrop, Caucasian Stonecrop, English Stonecrop, Greater Mexican Stonecrop, Hairy Stonecrop, Kamtschatka Stonecrop, Lesser Caucasian Stonecrop, Lesser Mexican Stonecrop, Mossy Stonecrop, Reflexed Stonecrop, Rock Stonecrop, Spanish Stonecrop, Tasteless Stonecrop, White Stonecrop. ..... cause by residues of the old brick works that was once on this site, the Horrabridge Brick Company. Looking down on the River Walkham from the bank. Apparently bats have been seen up there, already, - but I see no bats! Meadow buttercup, Ranunculus acris, a slightly damaged flower that I hadn't noticed when taking the photograph, ho-hum. Looking over the River Walkham to the Grenofen Bridge car park. 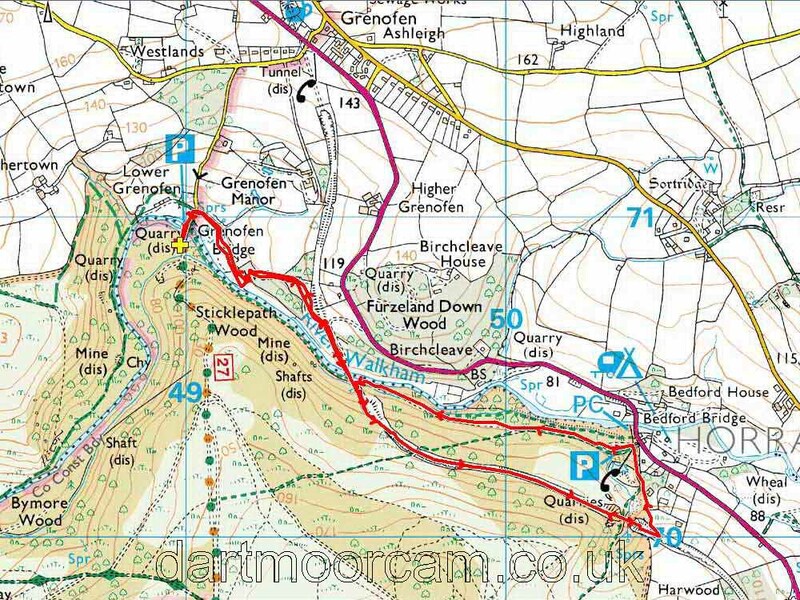 This walk was accessed via the A386 road from Yelverton to Tavistock, turning west almost opposite the Halfway House pub at Grenofen, then taking the second turning on the left, down to thwe car park over the small bridge that crosses the River Walkham, parking at the yellow cross on the map. Distance - 4.76 km / 2.97 miles.